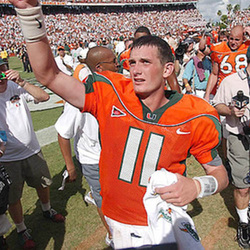 The University of Miami has long been known as Quarterback U, with the storied likes of George Mira, Jim Kelly, Bernie Kosar, Vinny Testaverde, Steve Walsh, Craig Erickson and Gino Torretta, but Ken Dorsey belongs in the conversation as arguably the best collegiate quarterback of them all. Dorsey came to Coral Gables after starring in both football and basketball at Miramonte High School in Orindo, California. The lanky quarterback would spend the next four years rewriting the Hurricanes record book and leading the football program back to national prominence. Dorsey is the winningest quarterback in school history with a 38-2 record as a starter. He set school and BIG EAST records for touchdown passes (86), and passing yards (9,565 yards), along with the Miami record for total offense (9,165) among the many career school records he holds. He was named the Maxwell Award winner in 2001 as the most outstanding player in college football after leading the Canes to an undefeated season and the school's fifth National Championship with a 37-14 victory over Nebraska in the 2002 Rose Bowl. In his senior year of 2002, Ken led the Canes back to the BCS Championship game, while sharing BIG EAST Offensive Player of the Year honors with teammate Willis McGahee. He was a Heisman Trophy finalist in both 2001 and 2002. Ken was selected in the seventh round by the San Francisco 49ers in the 2003 National Football League draft. He spent six years in the NFL with the 49ers and the Cleveland Browns before spending the 2010 season with the Toronto Argonauts of the Canadian Football League. He credits his close relationship with fellow UM QBs Gino Torretta, Bernie Kosar and Steve Walsh for some of his success. A three time BIG EAST All-Academic Team member (2000-2002), Ken graduated with a double major in Marketing and Business Management and was tapped into Iron Arrow, the highest honor one can attain at Miami. He is proud of the fact that his father, the late Tom Dorsey, watched every Miami game and became a die-hard Hurricane fan before passing away this past February. Ken and his wife Jordan have two daughters, Tyler and Logan, and live in Charlotte where, after two years as a scout for the team, Ken was named the quarterbacks coach for the Carolina Panthers beginning with the 2013 season.